In the first part of the workshop participants will be led through the traditional processes of creating decorated and marbled papers: various historical patterns for marbled papers (spotted, combed, waved, curl, peacock etc. 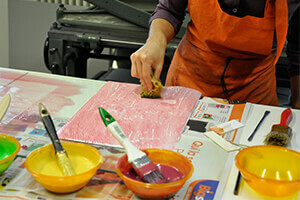 ), and for paste and decorated papers (sprinkled, stained etc.) using both fingers and tools. Historical recipes and colour preparation, and how to replicate them with modern materials when necessary, will be explained during the workshop. Each participant will have the chance to create samples for each technique and learn how to make variations on tools, materials and patterns. The second part of the course will be dedicated to bookbinding: using some of the paper participants have created, we will look at several paper bindings models (pamphlets, wrappers, limp bindings or rigid paper cases etc.) and together we will replicate some of these techniques. Paste paper has been used in bookbinding for over 400 years, where it has been used as both endsheets and to cover books. Early paste papers were made in Italy, France and especially Germany in 16th century with mono-coloured rice paste, the most common colours being indigo and burn sienna. The Moravians from Hernnhut (East Saxony, Germany), who were well known for their paste papers, emigrated to the USA in 1740s and popularised the process of Paste Paper in North America. 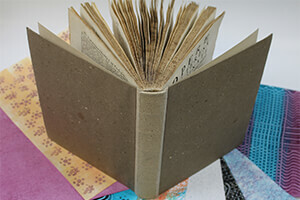 Paste paper was often made directly by the bookbinders, as paste being an adhesive that is used widely in the field. 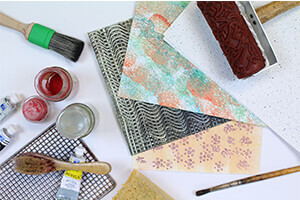 Decorated papers can be created by applying paste paint to a sheet of paper with a brush or sponge. Directly after the application of the paint, a decoration can be added with stamps or other tools, sometimes even with fingers. As long as the paste paint remains wet, all sorts of patterns and designs can be created. As paste paper is quite easy to create without many tools it is still commonly used as an artistic technique. It is also still used in bookbinding, with modern patterns, and with a greater range of colours and materials. Paper marbling is a technique of using colours floated on water to produce patterns like those found in marble and other kinds of stone. 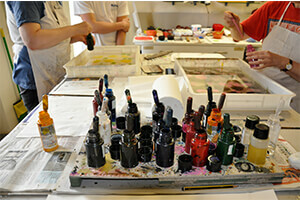 Inks or paints are floated on either water or a viscous solution and then transferred to the paper. The earliest examples of paper marbling originate from Japan in the 10th Century, where the traditional practices of using sumi ink on a water base (suminagoashi), which it is still used today. 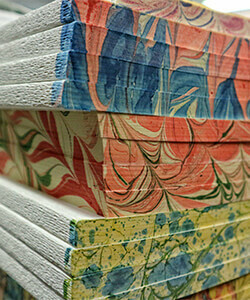 It is commonly held that the tradition of paper marbling entered Europe around the 17th century from Turkey where the technique is known as Ebru. Paper Marbling has been widely used through Asia, the Middle East, Europe and North America not only to embellish endsheets and paper for the book covers, but also to decorate book edges, stationery, and as a writing surface for calligraphy. 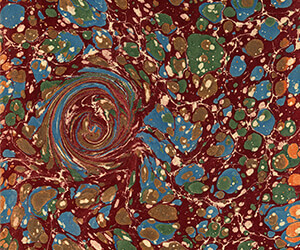 In 1853 Charles Woolnogh published “The Art of Marbling” which popularised the technique. Today the process of paper marbling is also used and explored as a decorating and artistic technique on three-dimensional surfaces, on fabrics, as well as the more traditional paper, and has also been combined with other mediums such as varnishes and lacquers. Paper binding spread widely throughout Europe between the 15th and 19th centuries. The technique was not only used by bookbinders, but also by publishers, printers, booksellers, librarians and private collectors. The results of the binding process have helped preserve in excellent condition many rare and ancient books, folios and other treasures. Due to the resistance and longevity of paper binding techniques conservators have been studying the processes in search of models for their rebinding work, that either use minimal amounts of adhesive or none at all. We will be looking at methods and techniques like wrappers, cased bindings, rigid, and flexible bindings, with both decorated or stiff paper on the cover. These structures are very simple and can nowadays be easily replicated with tools and materials available from local retailers. 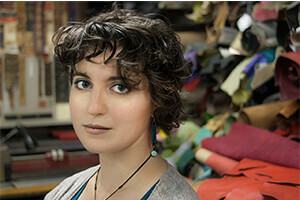 Paola Fagnola started training as a bookbinder at a young age in the “Centro del Bel Libro” ( Ascona, Switzerland) and later graduated as a “Book and Paper Conservator” from SAF-ICRCPAL (Rome, Italy). At the age of 21, she won the “Prix Gourmand de la reliure” at the Biennale Mondiale de la Reliure d’Art (St.Rémy-lés-chevreuses, France) with her first binding. More recently Paola was awarded 1st Prize in the bookbinding category at the “Pieces for Peace” competition in 2014 (Ypres, Belgium) and has been part of the Biennale’s jury since 2015. She is currently working as a Bookbinder and Book Conservator at Bottega Fagnola, the family-owned studio in Turin, Italy. She is also teaching and tutoring various programmes about bookbinding, box-making, and book conservation, for design and conservation schools all over Italy, including SAF-ICRCPAL (Rome, Italy). 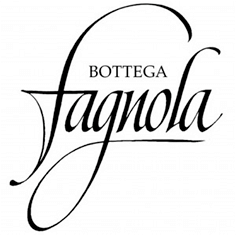 Bottega Fagnola was established in 1955 under the name of “Legatoria Rocchietti”. During the 1970’s Luciano Fagnola started as an apprentice at “Legatoria Rocchietti”. In 1981 Luciano acquired the ownership of the studio. He has extended the firm’s operations from solely craft bookbindings to include: box making; book and paper conservation and restoration; fine and design binding; and in recent years, teaching and mentoring in these techniques and processes. 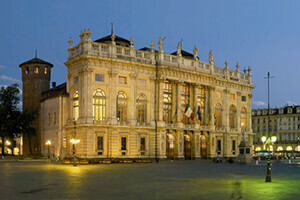 The “Bottega Fagnola” name today is synonymous with the high quality of craftsmanship of Luciano, Paola and their staff. They combine traditional craft skills with new technologies to create products and services, which are bespoke, avant-garde, and award-winning. TEC is delighted to offer you this great opportunity to learn about Bookbinding and traditional Decorative Paper making from an award winning Bookbinder and Book Conservator. We are limited to 15 places, once these are filled we will open a waiting list. 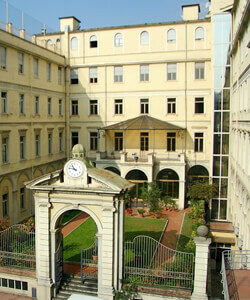 Seven nights of bed-and-breakfast accommodation at the Collegio San Giuseppe, in a single on-suite room. If accompanying partner wish to attend the course lunch there will be an additional charge of 15€ per meal. The rest of the fee must be paid no later than 30th May 2019.